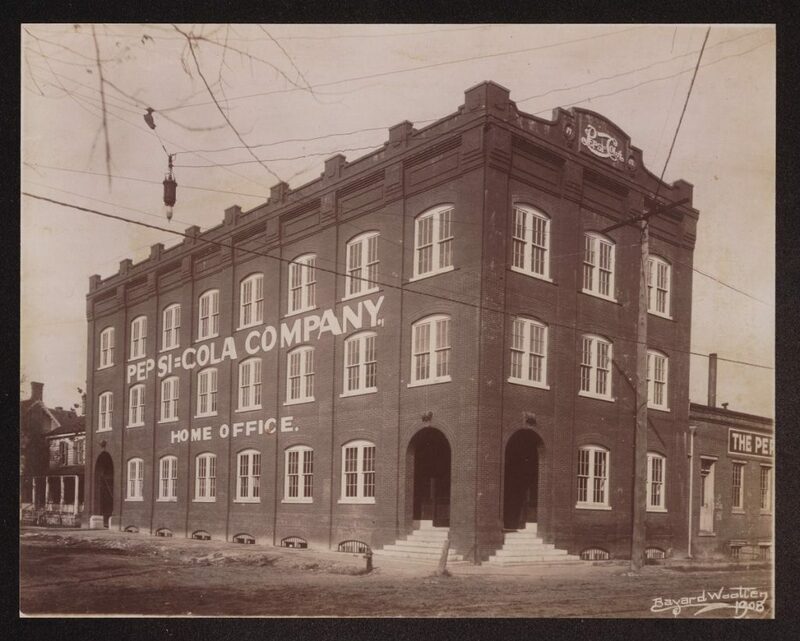 In 1893, a local Pharmacist invented a drink named Pepsi Cola and started a company which by 1915 had $1 million in assets. However, on May 31, 1923, his company officially declared bankruptcy. Who was he and what happened? Caleb Bradham grew up in Chinquapin, North Carolina, and graduated from UNC at Chapel Hill. He dropped out of medical school at the University of Maryland due to his father’s bankruptcy. He taught school in New Bern at the Vance Academy, and was able to then enroll at the University of Maryland School of Pharmacy. After graduation, he returned to New Bern and opened Bradham’s Pharmacy at the corner of Middle and Pollock Streets. Most drug stores at that time had soda fountains and featured various drinks. Caleb concocted a popular drink that his friends named “Brad’s Drink” in honor of Bradham. He renamed the drink Pepsi-Cola (thought to be a combination of Pepsin and Cola as he thought the drink would aid digestion). The drink sold well and Bradham decided to manufacture and patent it. The syrup was sold to drug stores where it was mixed with soda and sold as Pepsi-Cola. In 1903 he registered the trademark and soon gave up managing his pharmacy to devote all his time to this new company. Bradham was a talented salesman and visionary businessman. Pepsi was so successful that in 1905, Bradham began to bottle his product and sell it to grocery stores. He hired two bottling companies to keep up with the demand and created many jobs in New Bern and across the Southeast. He began selling franchises, starting with two in 1905. By 1910 he had 300 bottlers in 24 states and held the first Bottlers Convention in New Bern. Bradham began innovative advertising campaigns featuring famous people, the first of whom was race car driver Barney Oldfield. Due to the high demand for products, Pepsi was one of the first companies to ship products via motorized transportation rather than horses. Caleb Bradham was involved in all aspects of his business, but he also participated in community affairs. He served as the Chairman of the Craven County Commissioners, President of the People’s Bank of New Bern, Exalted Ruler of the Elks, as well as many other clubs and services. He was a member of the Naval Reserve for twenty-five years, retiring as a Rear Admiral. He funded the Bradham Prize for thirty years, a yearly scholarship at UNC for the Pharmacy student with the highest average. Despite much success, sugar prices contributed to the end of the company. During WWI, sugar was rationed, creating production problems. After the war, sugar prices fluctuated, and Bradham stockpiled sugar, predicting that the price would increase again. He purchased sugar at twenty-eight cents per pound, but in a short time, the price plummeted to five cents per pound. His customers refused to pay more than five cents per soda bottle, and Bradham could not meet production costs. 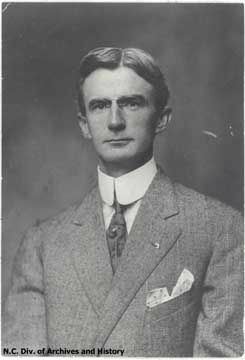 Despite his attempt to reorganize, Bradham was forced to file for bankruptcy in May 1923 and the company was sold to creditors for $30,000. 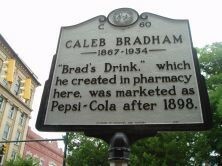 Caleb Bradham returned to his pharmacy but after a long illness, died on February 19, 1934. He is buried at Cedar Grove Cemetery. 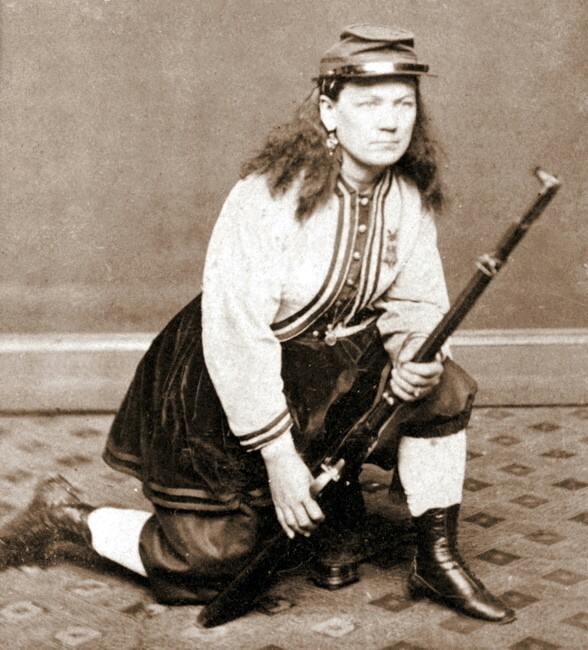 Cullen Andrews Battle was born in Georgia, grew up in Alabama, died in Greensboro, NC, and was buried in Virginia. Yet nearly three decades after his death on April 8, 1905, a temporary Army camp at Glenburnie Park, New Bern, was named in his honor - Camp Battle. What was this man’s connection to New Bern? Cullen A. Battle was born in Georgia in 1829 and raised in Alabama, graduating from the University of Alabama. He practiced law and politics until Alabama seceded from the Union in 1861. Battle raised a company of volunteers and joined the Third Alabama Regiment, fighting valiantly in many Civil War battles. He was promoted to Brigadier General after his gallantry at Gettysburg. After the war, he returned to Alabama to resume his law practice, and though elected to Congress, he was prevented from taking his seat. Battle’s son, Henry Wilson Battle, became pastor of the First Baptist Church in New Bern in January 1888. General Battle joined his son in New Bern and for a short period of time, edited the New Bern Sun Journal. He was elected Mayor by New Bern councilmen on 8 May 1890 even though he had not requested the office nor was he told about his nomination. He was a popular Mayor and an eloquent speaker. General Battle later followed his son Henry to Greensboro, NC, where he died. Thirty-eight years later, Camp Battle, located approximately two miles northwest of the city of New Bern, NC was named in honor of General Cullen Battle. The Eastern Carolina Fair Association had owned and used the property for local fairs until 1919 when the City of New Bern purchased the land from them for $15,000. The property was then used as a city park until 1942 when the US Army leased approximately 70 acres of Glenburnie Park from the City of New Bern for $1 a year. In 1942 the 1st Infantry Regiment was sent to Camp Battle to guard the Neuse and Trent River Bridges. Their mission was to patrol installations in the area, including Cherry Point and Camp Lejeune. Lieutenant Colonel Wilson Stephenson, the commanding officer, officially named the encampment Camp Battle. The Camp could house 753 military personnel. Improvements to the Camp were made by the government at a cost of $193,300 and included 85 wood frame buildings such as barracks, supply rooms, latrines, and mess halls. On June 20th, 1944, Camp Battle became a German Prisoner of War Camp where more than 600 POW’s were sent and housed. The POW camp was solely under DOD control during the period of their lease and use. In November 1946, the lease was cancelled. 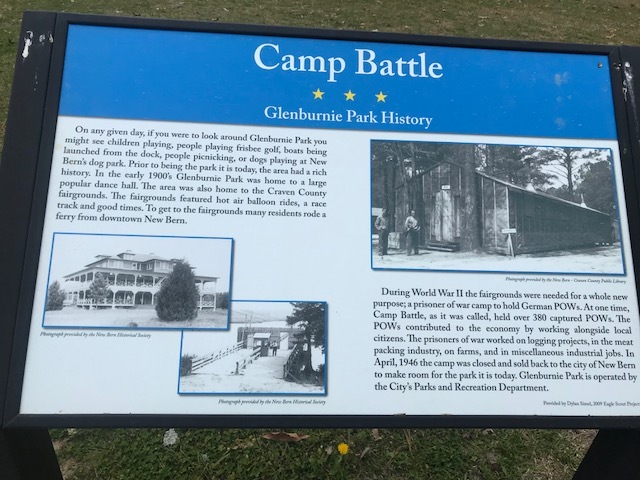 The site of Camp Battle is presently used as Glenburnie Park. There are no remnants of the camp itself; however one of the picnic shelters at the park may have the foundation of one of the Camp Battle buildings. A historical plaque commemorating the camp was placed inside the park with the assistance of an Eagle Scout in 2009. On February 8, 1864 the 35th Regiment of the United States Colored Infantry was organized. This Regiment was formed from the 1st North Carolina Colored Volunteers established in New Bern in 1863. At the beginning of the Civil War, African Americans were not permitted to serve in the armed forces of the United States. Congress passed both the Confiscation Act and the Militia Act in 1862 which allowed for the freeing of slaves if their owners were fighting against the Union, and allowed President Lincoln to use freed slaves in the armed services. In January 1863 the Emancipation Proclamation, claiming that all slaves residing within the rebellious states would be considered free, helped to spur recruitment of African American Regiments. On May 22, 1863 the US War Department issued General Order Number 143 which established the Bureau of Colored Troops. William Henry Singleton, a former slave, along with Abraham Galloway, recruited over 1,000 African American escaped slaves in New Bern for the First North Carolina Colored Volunteers. (Singleton later became a sergeant in the 35th USCT). They became part of the North Carolina African American brigade organized and commanded by Brigadier General, Edward A. Wild. During July 1863, the 1st Regiment NC Volunteers paraded on Academy Green in New Bern and presented their flag to Colonel Wild. The flag was designed by Mrs. Harriet Beecher Stowe, and the cost was $150 which was raised by the Colored Ladies’ Aid Association of North Carolina in New Bern, under Mary Starkey. The flag was presented to General Wild who then presented it to Colonel James C. Beecher, half-brother of Harriet Beecher Stowe, who commanded the regiment. The success or failure of the 1st NCCV would help to decide if it were feasible or not to raise more African American troops. While the 1st NCCV did not win a major battle for the Union Army, it served with distinction and proved that African Americans could provide a fighting force to assist the Union Army. After the formation of the 35th USCT in February of 1864, enlistment and training began in New Bern, and the troops headed further south. 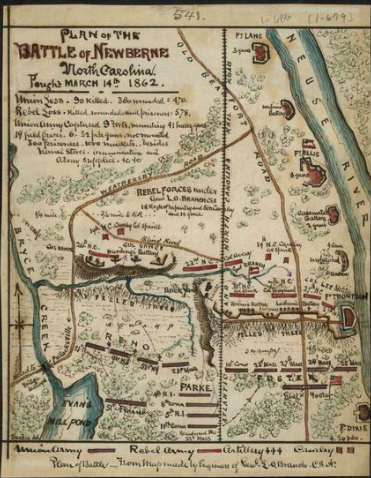 While in Georgia and South Carolina, they performed garrison duty and acted as laborers, but finally saw combat in Florida at the Battle of Olustee. Though this battle ended with a Union loss and high casualties for both sides, the men of the 35thUSCT fought gallantly and again demonstrated that African Americans were worthy participants in the armed services. In the last two years of the war, 175 regiments containing 178,000 African American men saw service. In North Carolina, four regiments of over 5,000 soldiers were raised, including the 35th, 36th, and 37th USCT, as well as the 14th US Colored Heavy Artillery. The 35th USCT fought well and earned high praise on the battlefield. During the invasion in NC near Carolina Beach during the winter of 1864-1865, at least nine USCT regiments took place as part of the Union naval and army forces that captured Fort Fisher and forced the surrender of Wilmington. 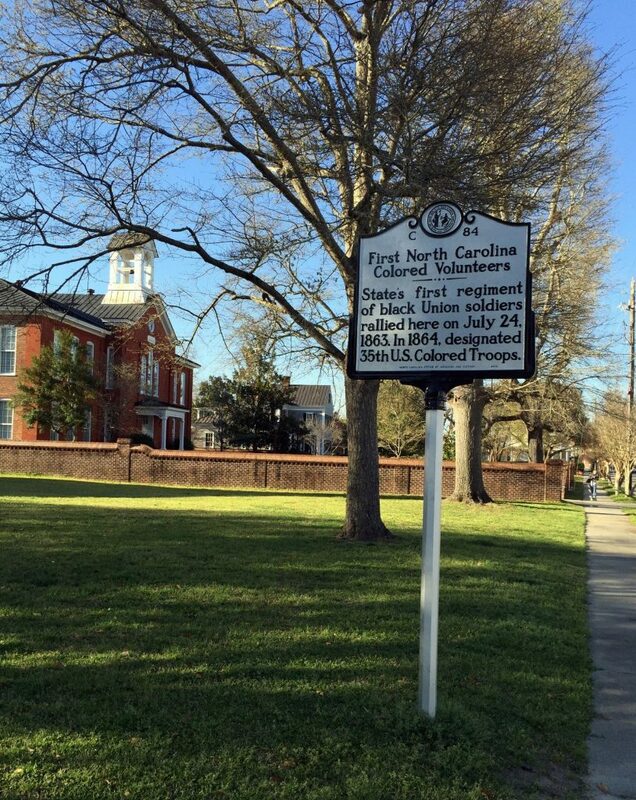 A marker in honor of the 1st NCCV and subsequently the 35th USCT was dedicated and placed on Academy Green at Hancock and New Street. A small article appeared in the 13 Jan 1897 Daily Journal (New Bern, Wed. p.2) stating “Notice is hereby given that application will be made to the next General Assembly of the State of North Carolina to change and amend the Charter of the city of New Berne.” At the next meeting in 1897, the name of our city was officially changed to its current spelling, New Bern. But what had been its official name prior and why did it change? New Bern was founded in 1710 by Baron Christoph von Graffenried of Bern, Switzerland. The Baron named it New Bern in honor of the city of his birth. In 1723, the General Assembly enacted that the place be “Incorporated into a Township, by the Name of Newbern… with all Privileges which ever have belonged to the said town, or shall hereafter be expressed, forever. (Laws of North Carolina, 1723-pg 204 Section XIII). Although the official name was Newbern, it was not spelled that way on various maps, newspapers, and official documents, which led to much confusion over the years. On June 6, 1891, Henry Gannett, a famous geographer and mapmaker wrote to the City Clerk, William Oliver, and asked him about the true spelling of the name. “Dear Sir, I find great uncertainty in spelling the name of your city. It is spelled Newbern, Newberne, New Bern, New Berne and Newburn. I take the liberty of appealing to you to inform us as fully as possible what the usage is in the official documents of the city. In case you have documents at hand, I should be glad to know under what name the city is chartered”. Oliver’s’ response was that “…up until 1862 the official name was spelled Newbern and it had been chartered as such.” Oliver sent Gannett a copy of the “Acts of the General Assembly published in 1793” as proof. Oliver referenced the fact that the town had been captured by Union forces and had been in the hands of Union troops for three years. “The post office, and every office both town and county, the banks, the newspaper, were all in the hands of those who recently settled here. The stamps at the post office at this time were changed from Newbern to New Berne as well as the newspaper and county offices. This change was made by comparative strangers without a scintilla of law or authority.” (State Chronicle, July 23, 1891, p.4) Gannett subsequently settled upon Newbern as the official spelling. In 1897 local businessman, James Augustus Bryan helped to initiate legislation to officially change the spelling again. The town continued to be referred to as Newberne which Bryan and others blamed upon Union soldiers for adding an “e” at the end. This led to the January 1893 notice in the paper that there was to be an application to change or amend the charter of the city of New Berne. This resulted in the General Assembly of NC action in February 1897 to establish that the “corporation heretofore existing as the city of Newbern shall hereafter be known and designated as the city of New Bern, and all laws in conflict with the above are hereby repealed.” Now you know when our city officially became New Bern. The morning of December 1 was cold and overcast with gale-like winds. At 8:00 a.m. a fire broke out at the Rowland Lumber Company, the largest sawmill in North Carolina. Every fireman and piece of equipment was sent to fight the blaze, but they had difficulty in controlling the flames sweeping through the dry lumber in the yard and were hampered by insufficient manpower due to the number of people who had left town for the game. At 10:45 a.m. a fire started in the chimney of a small house on Kilmarnock Street near the Five Point intersection in New Bern. By the time the firefighters responded, three more houses were burning out of control. The 70 miles per hour winds moved east towards the Neuse River. As the fire spread rapidly down to George Street the wind then spread the fire North and West. By midday, Fire Chief James K. Bryan, put out frantic calls to neighboring towns for help, and fearing that the entire town would be destroyed, decided to use dynamite to level the houses in the path of the inferno and to create a firebreak. Shortly before dusk, the wind shifted and died down and the fire was finally brought under control. Unbelievably, there was only one casualty, an elderly African American woman who was too crippled to escape her home. That night, fire victims sought refuge in Cedar Grove and Greenwood Cemeteries and many had escaped with only the clothes on their back. Fort Bragg responded to a call for help by sending eight freight cars loaded with tents, cots, mattresses, and other needed equipment and officers and men arrived to oversee the erection of the tents which later became known as “Tent City.” Cots, blankets and clothing were sent by the Navy base at Norfolk and nearby towns immediately began collecting used clothing and money to help the homeless. The Red Cross moved in and was placed in full charge of the relief effort. West Street School, which miraculously escaped the fire, was opened to feed thousands of meals for the African Americans who were homeless. Local businesses and townspeople assisted in these endeavors. The City decided to condemn about twenty acres of the burned area to widen and straighten the streets, to extend Cedar Grove Cemetery and to create a city park. There was much protest over this decision because most of the houses that had stood in the condemned area were owned by the African American families who had resided there. Today, Kafer Park, the cemetery extension, and the George Street Senior Center building are on this property. In case you wanted to know, New Bern won the championship game, 6-0. 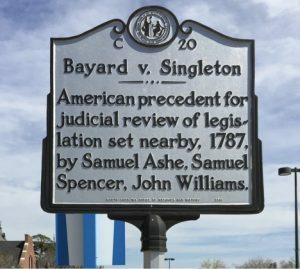 On November 26, 1787, in New Bern, a judicial milestone was set in the landmark case of Bayard vs. Singleton. The case is significant not just for the judicial precedent set in this case, but also for the number of attorneys and judges who played major roles in the history and development of our new nation. Samuel Cornell was a wealthy merchant in New Bern and one of the richest men in the state. During the Revolutionary War, he remained loyal to the King. He refused to sign an oath of allegiance to the revolutionary cause and fled to England in August of 1775. He returned in 1777 to his family’s home in New York. Meanwhile, the NC General Assembly confiscated his land and home and sold it to help finance the war. A local New Bern merchant, Spyers Singleton, purchased Cornell’s home. The Cornell family resided in Flushing, NY where one of his daughters, Elizabeth Cornell, married William Bayard Jr. In 1787, Elizabeth Cornell Bayard returned to New Bern to file a lawsuit against the state to recover the property that had been deeded to her by her father. A lawsuit was filed on her behalf by her attorney Samuel Johnston (who later became Governor of NC). William R. Davie (who also became Governor and was known as the “Father” of the University of N.C.) assisted Johnston. James Iredell, a legal scholar, was also retained by Mrs. Bayard and he later became a US Supreme Court Justice. Spyers Singleton, the defendant, hired another future Governor, Abner Nash, as his attorney along with Alfred Moore (who would later serve on the US Supreme Court). The essence of Bayard’s argument was that North Carolina’s Constitution of 1776 guaranteed a citizen the right to a jury trial in a case involving the loss of property rights. After the war ended, the 1783 Treaty of Paris stipulated that confiscated property would be returned to its original owners. However, in 1785 the NC legislature barred state courts from hearing lawsuits by former Loyalists trying to recover their property, contrary to the Treaty of Paris. The court, consisting of Judges Samuel Ashe, Samuel Spenser and John Williams heard the case but delayed a decision, hoping that either a settlement would be reached or the legislature would repeal the confiscation laws. After the parties could not come to an agreement, the court concluded that it could not enforce the 1785 NC statute as it was inconsistent with the Constitution. The decision was highly controversial. Richard Dobbs Spaight, one of the signers of the US Constitution, questioned whether the court had a right to overturn legislation as unconstitutional. The court eventually ruled against Bayard, citing the fact that when her father left for England, he did not return before the General Assembly confiscated his lands. Therefore, he was not actually a citizen of the US. The court ruled that Mrs. Bayard, as a citizen in 1787 had a right to a trial, but Cornell did not have the right to deed his property to her in 1777 in the first place. As possibly the first legal decision in the new United States in which a court nullified a law because it was found to be unconstitutional, this ruling was an early example of the system of checks and balances vital to the new American democracy. Bayard vs. Singleton served as a precedent and precursor to Marbury vs. Madison, the 1803 US Supreme Court decision that established judicial review. On October 21, 1945, New Bern born architect, Herbert Woodley Simpson died. He was one of only a few architects practicing in New Bern and eastern North Carolina during the 1890’s to 1920’s. Simpson is credited with the design of almost every major structure built in New Bern in the first two decades of the 20th century. He was a versatile designer, but excelled in the Queen Anne style as well as the neoclassical revival style. Herbert Woodley Simpson was the son of John Archibald Simpson and Mary Higgins Simpson. His father was a New Bern builder, carpenter, casket maker and undertaker. As was the practice then, Simpson studied architecture with W. Claude Frederick in Baltimore, Maryland from 1888 to 1890. After finishing his studies, he worked with Beaver & Offmeister, Architects in Knoxville, Tennessee. Simpson returned to New Bern in 1891, where he began to establish himself as an architect. His first known project is believed to be the Queen Anne style John R.B. Carraway House, which was the lifelong home of New Bern historian Gertrude Carraway. Simpson followed this with the Queen Anne style Christ Church Rectory and other similar residences. He planned several religious buildings including Centenary Methodist Church (1904) in collaboration with New York architect Charles Granville Jones, St. Cyprian’s Episcopal Church (1910-1912), the First Church of Christ, Scientist (1907) and Temple Chester B’nai Sholem(1908). His principal civic building was the Carteret County Courthouse (1907) in Beaufort. Simpson was a prolific designer and produced plans in all different styles. Among his early clients was the local Blades family, lumber magnates. Lumber industries in New Bern flourished during this period and many wanted to build large and impressive homes and buildings. The William B. Blades House (1903), still standing, is a quintessential Colonial Revival home with neoclassical columns and pediments, as well as beautiful interior woodwork. Simpson’s most spectacular residence was the James B. Blades House (1913), a granite and yellow brick mansion that later became the Queen Anne Hotel (no longer standing). In addition to new homes in this style, Simpson also assisted clients who wanted older houses remade in this new style. The Coor-Bishop House, and the J.A. Jones Residence were transformed into columned Southern Colonial mansions. Simpson married Nettie Tolson on April 21, 1897 and they had two children, John Arch Simpson and Helen Elizabeth Simpson. Simpson left New Bern in 1914 for Norfolk, Virginia, where he continued his practice. In the 1920’s, John Arch Simpson joined his father’s practice which became Herbert W. Simpson and Son until his father’s death in 1945. Herbert Woodley Simpson was buried in Cedar Grove Cemetery in New Bern with full Masonic rites. 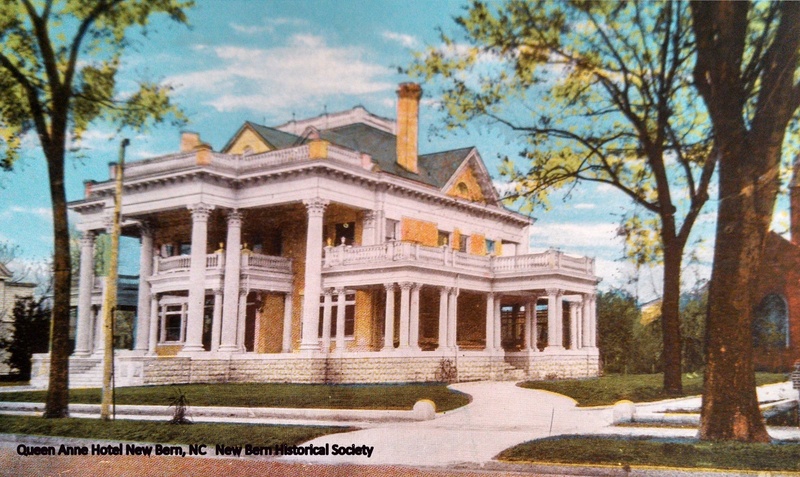 Some other notable homes in New Bern designed by Simpson not previously noted include the C.S. Hollister House, C. Foy House, Dunn Building, Gaston Hotel (remodeling) H.B. Marks house, Larry Moore Home, Pepsi Cola Factory, R. Duval Jones home, St. John’s Masonic Lodge (enlargement and remodeling), Walter Duffy Home, and the Athens Theatre (1911). 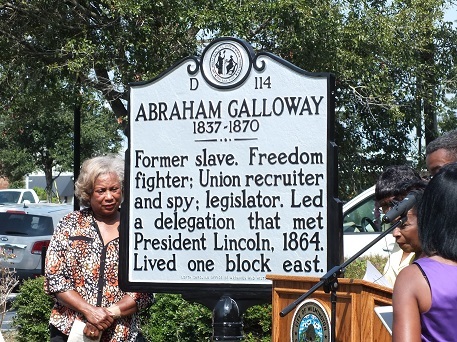 On September 1, 1870, Abraham Galloway — slave, abolitionist, spy, recruiter, and political leader — died in Wilmington, NC. He was only thirty-three years old when he succumbed to fever and jaundice. He was born to a white father and a black mother, who was a slave in Smithville, NC. His owner allowed him to seek masonry jobs, but when he could not earn the required $15 per month, Galloway decided to escape. At the age of 20, he hid on a ship loaded with turpentine and fled from Wilmington, NC to Philadelphia, PA. In Philadelphia, he became an abolitionist and began working with the Underground Railroad to help people escape to Canada. In 1860 Galloway traveled to Haiti to help recruit to prepare for a military invasion of the American south. In 1861, Galloway returned to the US and began work as a spy for the Union under Major General Benjamin Butler. Galloway was captured at Vicksburg, and after his release or escape he made his way to New Bern. In 1863 he married Martha Ann Dixon in Beaufort. That same year he was able to free his mother from enslavement in Wilmington, and brought her to Union-held New Bern. The Union Army needed troops and General Order No 143 of the US War Department, dated May 22, 1863, established the Bureau of Colored Troops to recruit and train freedmen and emancipated slaves to fight. Galloway began recruiting African Americans to enlist in the Union Army, but Galloway had four conditions that must be met before blacks in New Bern would enlist. They were to receive equal pay to that of the Massachusetts Regiments, the Army had to provide for their families who were mainly refugees, the Freedmen’s Bureau had to set up schools to teach their children to read and write, and the US government had to agree that if they were captured, they would have the rights as legitimate military prisoners of war. These conditions were ultimately agreed to, and within days of that, hundreds of recruits arrived. The new regiment was designated the First North Carolina Volunteers (later becoming the 35th US Colored Troops). Galloway soon became an important and influential political leader. In May of 1864, he was part of a delegation of five black leaders who met with Abraham Lincoln advocating for suffrage for African Americans. He was one of 144 black leaders who attended the National Convention of Colored Citizens of the US, the most important gathering of African American leaders during the Civil War. By 1865 Galloway had organized a state chapter and five local chapters of the National Equal Rights League. He also helped to lead a freed people’s convention. In 1868, despite threats from the Ku Klux Klan, Galloway ran for the state senate in the first election in which Blacks were eligible to hold state office. He was one of three Black senators and seventeen Black representatives in the NC General Assembly. Galloway was able to vote for the 14th and 15th Amendments during his tenure. Abraham Galloway was an advocate for African Americans, not only in New Bern, but throughout the north and south. As a testimony to his influence, six thousand people attended his funeral. Samuel J. Battle, born January 16, 1883 in New Bern, was recorded as the largest baby born in NC at 16 pounds. He would grow to be 6”3” tall and over 280 pounds. By the time he died in New York City on August 7, 1966, he was a legend in the NYC Police Department. Samuel Battle’s parents were born into slavery, and he was one of nine siblings. As a teenager, he was caught stealing money from the safe of his boss, R.H. Smith. His boss did not press charges because of his friendship with Battle’s father, a Methodist Minister. Smith predicted Battle would be in prison within a year, but Samuel decided to do everything in his power to prove him wrong. Samuel Battle went north and had several jobs, including as a $32/month red cap at Grand Central Terminal. Battle was influenced by his brother in law, Moses Cobb, who was hired as a police officer for the City of Brooklyn. Samuel also decided that he wanted to become a police officer as it would provide him the ability to support his young family. Samuel J Battle became the first African American to be appointed to the 10,000 member force after the police forces merged in 1898. He was originally turned down because a police surgeon declared he had a heart murmur, but after several prominent blacks protested to city officials, he was given another medical exam which he passed. 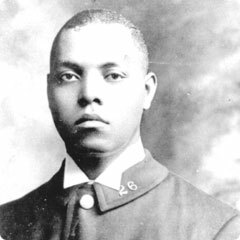 He officially joined the force on June 28, 1911 at the age of 28. He was assigned to the West 68th Street station house, but suffered years of silent treatment from his fellow officers. He was not allowed to bunk with the other officers at the station house, so a mattress was moved to the second floor where the American flag was stored. While in that room, he studied for the Sergeant’s exam. Although he was passed over three times, he would later become the first African American police sergeant (1926), lieutenant (1936) and the first African American parole commissioner (1941). Mr. Battle served on that commission for ten years, retiring in 1951. While on his first beat in the San Juan Hill section of the city (where Lincoln Center is today), tourist buses would stop and point him out. He was soon moved to Harlem, where he lived. In 1919, Battle rescued a white police officer during a battle with rioters at 135th and Lenox Avenue. In 1935 Battle helped to quell a riot in Harlem which was started by the arrest of a 16 year old shoplifter. 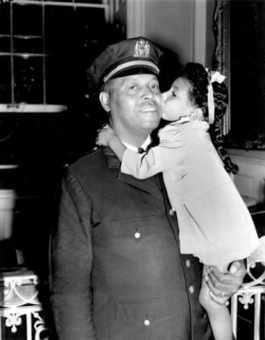 Samuel Battle retired from the New York City Police Force in 1951 at 68. He was the highest-ranking African American on the force at that time. In 2009, the corner of West 135th Street and Lenox Avenue in New York was renamed Samuel J. Battle Plaza in honor of his achievements. That street corner marked the location where Battle saved the white officer’s life during a racial skirmish in 1919.